Ecuador: Failed Coup or Institutional Crisis? 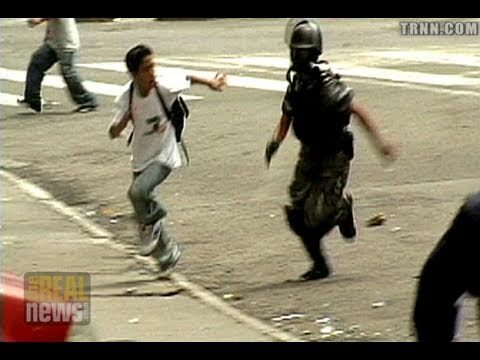 This is a special report about the Police Force insurrection and kidnapping of Ecuadorian President Rafael Correa on September 30th, 2010. President Correa was held hostage for 11 hours by a large number of armed policemen inside the Quito Regiment. Eventually leading to street battles and a bloody ending that gripped a nation. My name is Oscar Leon, reporter and documentary filmmaker from Ecuador. Between 2005 and 2007 I created the documentary "Third World Democracy Handbook" about the fall of President Lucio Gutierrez, at that time he was the 3rd President to fall in less than 10 years, had Rafael Correa fell he would have been the 4rd to fall in less than 14 years. Being a reporter in Ecuador during the "Lost Decade" I can bring some insight about what happen that day. Was this a institutional crisis? Or a foreign power's attempt to overthrow him? This infamous day it's being utilized by both political sides. But what is the truth behind it? In order to get a better understanding of what happened on Part 1 we will explain some necessary context. In the Part 2 of this special report we will go over what toke place on September 30th 2010. OSCAR LEÓN, REPORTER AND FILMMAKER: Welcome to The Real News. My name is Oscar León, reporter and documentary filmmaker. This is a special report about the police force insurrection, the kidnapping of the president, Rafael Correa. Being a reporter in Ecuador during the lost decade, I can bring some insight about what happened that day. Between 2005 and 2007, I created the documentary Third World Democracy Handbook, about the fall of the third president in a row in less than 10 years. If Rafael Correa fell, he would have been the fourth in a row in less than 14 years. Did a coup d’état really take place on September 30? In order to get a better understanding of what happened, allow me to explain some necessary context. Debt traps. Living in both countries, I have found that many of the American people can relate with these words and to the experience of Ecuadorians like myself. Maybe you were one who used to pay an $800 mortgage and all of a sudden had to pay $1,600 or more because of those debt traps. Well, something very similar was what many South Americans’ country like mine went through. Beside the 300 percent increase in the interest rate, private banks’ debt was also transferred to the state in a very similar fashion to what happened in September 2008 here in USA. By the end of the ’90s, this economic disaster put the taxpayers in a debt trap that will last for many generations to come. Ecuador is a small republic in the Andes. Its geopolitical importance goes beyond natural wonders, raw materials, oil, and the US [war] against drugs. During the last century, American corporations have got the biggest piece of the pie, getting cheap raw materials and manipulating the politicians in charge, while the military police and intelligence agencies were closely trained by the Pentagon in the infamous School of the Americas and other US institutional facilities. It is hard for any man to rule a country with so many interests at stake like Ecuador. Many loyalties were bought, and some other leaders were dealt with in a different way. The little money collected by the state from foreign corporations was destined to pay the debt by leaders that only cared to please themselves and their powerful masters. This policy brought a lost decade upon my country. Between 1996 and 2006, three coups d’état and ten different presidents shook the nation, broke the economy, pushed the socialist structure and the people to the limit, and created great instability. All those governments fell because they were incapable of dealing with the profound economic crisis that followed the IMF shock therapy and the rise of privatization and globalization. And during those government last hours, it was the police who defended the regimes at all cost. Certainly, the police track record of repressive actions and human rights abuse didn’t make them very popular with citizens. At the end, it has always been the military leadership that decides who stay in the presidential palace and who gets kicked out. They act as a panic button by stepping aside or going in to take control. The army might decide who stays in the Palace of Carondelet, but it is the people who elect and takes down presidents. The voice of those who took the streets, and by votes the power, was the need for a strong government that can take a tough stand when it comes down to [inaudible] nations, rich resources, and people. All along the Latin American continent the voice was the same. People were rising up. And over the past decade, 13 countries have elected left nationalist tendency governments. Only Mexico, Colombia, and Peru haven’t gone through that path. Rafael Correa was the natural leader of this citizens’ revolution. A charismatic economist, he quickly rose to power, and once in there he implemented many of the people claims. Strong and charming, he achieved much in a short time: materialized the citizens’ demand for a new constitution created by a popular assembly; renegotiated oil contracts, giving less to the big oil companies and more for the government’s project. Despite prioritizing social programs over debt service, Correa still managed to rid the country of two-thirds of its creeping foreign debt, reducing it from $3.2 billion dollars to $1 billion. He lowered his own wage to set the example. He balanced the budget and increased monetary reserve. This is especially hard in a country that has an heritage of mega crises. He invested a huge amount of resources in social programs and infrastructure investments. This was funded through a more effective tax collection and the seizing of assets of bankers who fled the country on the charge of corruption. As part of the war on drugs, United States has a military airport on the city of Manta. Its removal was a crucial point in this citizens’ revolution. Correa explained why he didn’t renew the base during an appearance on Democracy Now! AMY GOODMAN, JOURNALIST, DEMOCRACY NOW! : —military bases in Latin America, Manta, expires later this year. You will not renew it. Why? RAFAEL CORREA, PRESIDENT OF ECUADOR (VOICEOVER TRANSLATION): Why renew it? Now, if you’d like, I would renew it with one condition: that they allow me to set up an Ecuadorian military base here in New York. If there’s no problem with foreign bases, then let’s reach an agreement on that. I think that everybody listening is going to find that impossible. And to us Ecuadorians it also seems impossible, based on our outlook, informed by sovereignty, at least with the current government, to have a foreign military base on our soil. LEÓN: In April 2009, I spoke to John Perkins, author of the best-selling book Confessions of an Economic Hitman. He predicted that Rafael Correa was at greater risk than any other Latin American president. JOHN PERKINS, ECONOMIST AND AUTHOR: I personally think that Correa is one of the presidents in the most danger. I think Chávez is almost too visible now for us to do anything to. I mean, it’d be obvious. If something happens to Chávez, it’s pretty obvious. He’s also got, I think, very good protection. But Ecuador is, like, this key country. It has a lot of oil, and it’s always been a country that when we wanted to in the United States we could control it. And now suddenly you’ve got this president who not only is standing up to us, but he’s a president who had a PhD in economics from one of our universities, the University of Indiana, which is a real slap in the face. You know? It’s like—and you can’t accuse Correa, the United States can’t accuse Correa of being a communist or anti-capitalist. He has a PhD in economics from the University of Indiana. LEÓN: The concern for the life of Rafael Correa are not new. This is an interview with his right-hand man and Cabinet member on April 27, 2009, after he won the elections in a landslide. RICARDO PATIÑO, POLICY PREMIER, ECUADOR [SUBTITLED TRANSLATION]: We obviously have to take care of our president. We have taken measures to protect our president, but danger won’t prevent us to say what needs to be said. We have been very clear since the campaign—and some of us 10 to 15 years ago—about the nasty role that the IMF and World Bank have played, especially the IMF in the case of our country. It wasn’t advice they gave us; they inflicted permanent damage on us. And we will continue to point this out, even if many don’t like it and try to hurt our national project. LEÓN: After the right-wing military coup in Honduras in 2009, Correa said he thought he will be next. This threat seemed to become real last week when President Correa was assaulted and held hostage by a few hundred policemen on strike. Was this an institutional crisis or a foreign powers attempt to overthrow him? In the second part of this special report, we will go over what took place on September 30, 2010. For The Real News, this is Oscar León.